Get affordable Security Camera installation on Lakewood, CA and CCTV equipment with commercial quality and 2 years warranty. Protection4less install 2 kinds of technologies on security cameras: TVI high definition analog and IP. The IP system has advantage over analog systems. The resolution of the analog security camera system can give you up to 3 megapixels. The IP security camera system can give you 5, or more megapixels. On IP system the frame rate of the camera at 2 megapixels is 30 fps, but with resolutions of 3 megapixels or more the frame rate can drop to 20 or 15 fps: the picture will clear but the movement capture in the video will be just a little shaky. For most of the customers there is no problem with this, some of them don’t notice this effect. In the future the technology will bring faster processors, and huge hard drives. We will get 6 megapixels with frame rate of 30 fps. With these new technologies we will capture more and more details on the video, making possible to law enforcement to catch the perpetrators who committed a crime. In Protection4less we have the best of both technologies: CVI and IP. We use high quality materials to perform the installations, and all the CCTV equipment tha we use is commercial grade. 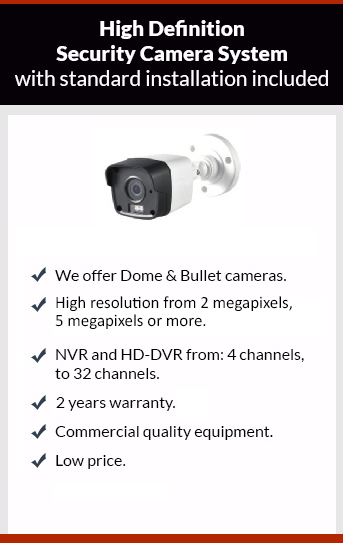 If you want the best security camera for your business, or home give us a call. The estimates are free.